I am writing to tell you about a journey that I have taken to Inner Earth or Agartha, last night and early this morning, September 14th. I told you yesterday that I felt unusually strong and hyper-aware of my surroundings, with an enhanced intuitive connection to everything around me. I told you that I felt something was going to happen with me, that they had a planned event for me, and well, this is what it was – a journey to Agartha. It began last night as I was getting ready for bed. I noticed that the Elohim and Archangel Michael were here. There was one other Being, his name was Sanat Kumara. It wasn’t until later that I realized that Sanat Kumara holds an important position of authority for Inner Earth. It was 10:15 p.m. and I closed my eyes. The first thing I remember is arriving inside a silver “metal” elevator. It was very large inside and AA Michael left me with a Guide, who appeared to be Human, although very tall. She attended to the control panel on the wall. The elevator ran smoothly and silently, almost like a mag-lev train. We rode this elevator for what seemed like several minutes. It made what felt like a vertical descent, on a 5 degree angle. I could envision the elevator shaft at a 5 degree angle, at least. I am uncertain how I have physical knowledge of where my body was orientated and what direction we took in this elevator – I seem to have all my bodies’ proprioceptors on-line, so that I felt it when my body was not vertical. I honestly felt as though my physical body was even in that elevator but I don’t understand how that works, it’s all so odd. You may have some ideas about this. The next “phase” that I recall was when I was instantly standing next to a body of deep blue, crystal clear and clean water. There were many emerald green islands in front of me. A very tall man instantly appeared beside me after I arrived. It was Adama of Telos. Adama accompanied me everywhere to show me around, all the cities, the countryside, and how everything was inter-creative, I call it. It was so strikingly beautiful and peaceful. There was a calm about the place, and there was almost no sound. I recall Adama showing me a white map with black drawings of land masses and black dots for the locations of cities. There was one particular city that he was keen on showing me how to travel there, where it was located. He circled this spot with a bright red felt pen. Our method of communication was fully telepathic. I am researching the web for any maps of Inner Earth so that I might find this city of light that he was showing me. Of course, it is difficult to know if information on the web is based on science fiction or on real experience. I believe the name of the city is “Shamballa”. This name was floating around my mind over the past few hours, so this may be of importance. Perhaps someone who reads this article may have information about Inner Earth and may even have a map. This location is important to our mission, or the mission of the Agarthans. There is also an area of great concern for us all, just to the left of this city. I am uncertain what this all meant, but I am meant to find this site. Both these visits were in full consciousness and I have a solid memory of the visuals and the sensations of my body, on each visit. I may have taken a third trip, later on this morning, but because the visuals were erratic and disconnected, I am uncertain if that was where I actually went. Upon awakening from the second visit, Adama was present in my room. He is so tall! Adama: ”I am Adama, of the City of Light, of Telos. It was I who accompanied you through to the Inner Earth visitation. You are a brave and trusting Soul. I am as honoured to be with you, as you with me. 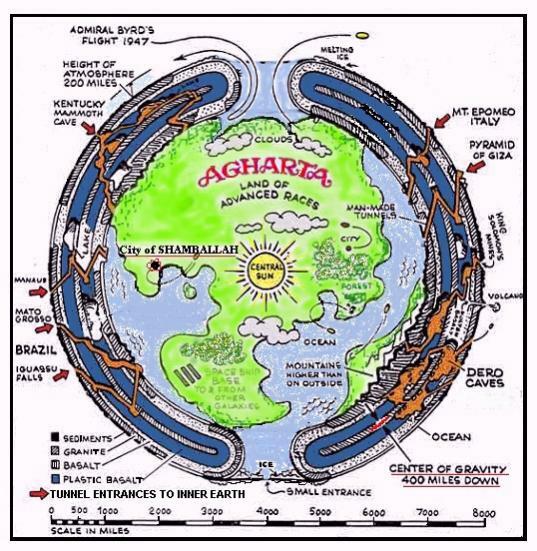 I have been researching “Agartha” and came across a very compelling story by a Colonel in the United States Air Force. His name is Billie Faye Woodward. His story is a first-hand account of his life inside the planet, and it is fascinating. I came across a facebook page called Expedition to Inner Earth Agartha 2013. There is also another place where it can be read: abovetopsecret.com/onelight.com. The information was offered on January 10, 2002 in an interview with Greg Gavin/Onelight.com. You have reminded me that April’s HS mentioned that the Agarthans will come on the surface of the earth at the time of our ascension to assist the people on the balanced 4D earth, until our return. I had sort of forgotten this but now it is all coming back. It would be very interesting to talk to April about this, now that this door has been opened for everyone. I am certain she has important information with regard to this visit. I am retiring early tonight, as I feel very drained from these events, for some reason. I am also expecting another visit from Adama. If you should have any comments or questions, please email me anyway, although I may turn my phone off for the night. If I wake in the night, I will check for a message from you. I was very happy to hear that it was deemed important to present more information on Agartha on your website prior to the PAT detonation, as it will most definitely give ascending humanity a much broader consciousness, offer them a far more concrete idea of what 5th dimension life will be like, and prepare them for contact with these exquisite 5thdimensional Beings. If you are not already familiar with the three volumes of Telos, I’ve found that them to be of the highest vibration of other books and websites that offer information about Telos and the Agarthans. These books were channeled through Louise Jones, a disciple of the Ascended Masters, and who I knew in Montana from the 14 years I served on the staff of The Summit Lighthouse (Mark Prophet’s organization that was directly sponsored by the Ascended Masters for the dissemination of their Teachings). The combination of 1) Louise Jones’ purity after the many years of giving the Violet Transmuting Flame decrees, 2) her devotion to the Great Brotherhood of Light, and 3) her direct Telosian tie with Adama and her twin flame, Ahnahmar, allow for the clearest and most inspiring information on this subject that I have yet to find. While much interesting detail is given regarding 5th dimension day-to-day life in Telos, the City of Light, the history of Lemuria and Telos, architecture, animals, etc., the ultimate purpose of the three volumes is to prepare the advanced student of the Light for the initiations that will lead to ascension to the 5th dimension and beyond, as well as to prepare the initiate for contact with theTelosians/Agarthans when the time is right. Volume 3 is entitled Protocols of the Fifth Dimension, which takes the reader through a no-nonsense tour of the Ascension Temple in Telos by Serapis Bey and Saint Germain in which they discuss the Atomic Accelerator/Ascension Chair. There is also a chapter on “The Dark Night of the Heart” that discusses the soul’s final initiations and trials that are very personal and unique, and which must be faced without any illusion, delusion, self-justification, fear, or self-pity. From the minute I began reading Volume 1, I was unable to put the books down. It is impossible to come away from reading these books without a very tangible sense of Adama. The exquisite vibration of love that comes from his meticulously chosen words and detailed teachings is to be distinguished from any other channeled messages that are floating all over the Internet. Louise Jones (now Aurelia Louise Jones) has since taken her ascension in the 5th dimension and resides in the Inner Earth city of Telos. Carla, you may wish to make contact with her during your visits. While nothing can replace the first-hand visits that you, Carla, will be making to Telos and the most up-to-date information that you will be given that is directly intended for ascending humanity, these three short volumes serve as an excellent introduction to this amazing group of Beings and how their 5th dimensional civilization will offer the prototype for the Golden Age on the surface of the balanced Earth. With deepest gratitude, respect, and eternal love for your dauntless, fearless dedication to the Light and for the unfailing constancy of your Service to God and all of humanity until the very, very end . . .
Espero ayude a su investigación sobre Shambhala . I haven’t read the whole story, and I know that you will probably want to scan and read it yourself. I hope these books will give you all the necessary information on the Inner Earth Agartha you need for now.